Kansas requires supervisors of food service establishments and non-retail food service establishments be certified in food protection. This means a person-in-charge, an owner, or manager of a food establishment – (i.e., restaurants, bars, cafes, bakeries, delis, mobile vending, food trucks, assisted-living, day care centers, and convenience stores) become certified by taking a approved food manager training course and successfully passing an accredited food manager certification exam. 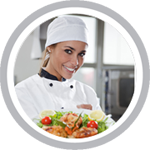 Our HACCP training course is the first accredited nationwide HACCP course for retail food establishments. The HACCP for Retail Food Establishments course is accredited by the International HACCP Alliance (360 Training) and teaches the theories and practices of HACCP. Once learners have successfully completed the course, they will understand how HACCP is applied through Active Managerial Control (AMC) to establish a functional food safety management system. Accredited by the International HACCP Alliance, this course presents the characteristics and application of Hazard Analysis and Critical Control Points (HACCP), a risk prevention management methodology that applies appropriate science and technology to plan, control, and document safe food processes in a food facility, consistent with the FDA’s desire to implement a voluntary HACCP program. The course introduces HACCP’s principles and concepts. The HACCP approach begins by identifying biological, chemical, and physical hazards associated with facility construction, equipment, employees, food, and supplies and then explains the scientifically validated hazard control procedures that prevent, eliminate, or reduce hazards to levels that protect public health. Audience: Wait staff – servers, chefs, cooks, mobile food vendors, bartenders, host/hostesses that handle food, bussers, caterers, supervisors and managers, food warehouse staff, and convenience store (c-store) clerks. Identify the biological, chemical, and physical hazards in the food offered to consumers in a food system. Determine which hazards are significant risks. Determine, write, and validate adequate controls for those hazards. Write a Food Safety Management Plan that provides an appropriate level of protection for customers. Train and supervise employees to perform controls that strive for zero customer illness or injury during the life of the business. Upon successful completion of the course, the certificate of completion will be available from the training page. Accredited by the International HACCP Alliance, this course aims to teach you the importance and use of all 7 principles in order to make you a safer, more effective food service employee. This course meets the regulatory requirement of compliance with the 2013 FDA Food Code and the USDA Requirements for School District HACCP Plan Implementation. The Seafood HACCP regulation defines processing as handling, storing, preparing, heading, eviscerating, shucking, freezing, changing into different market forms, manufacturing, preserving, packing, labeling, dockside unloading, or holding fish or fishery products. 21 CFR Part 123 – the “Seafood HACCP Regulation” requires all seafood companies (domestic as well as international exporters to the United States marketplace) process products in accordance to HACCP principles as specified in this regulation. The Seafood HACCP Course follows the Seafood HACCP Regulation that defines processing as handling, storing, preparing, heading, eviscerating, shucking, freezing, changing into different market forms, manufacturing, preserving, packing, labeling, dockside unloading, or holding fish or fishery products. Audience: Fishermen, seafood processors, packers, importers, and retailers, seafood safety inspectors, health professionals, and students interested in seafood careers – who are responsible for handling and keeping seafood products safe for customers. Describe why a Hazard Analysis and Critical Control Point (HACCP) management system is an effective means for assuring food safety. Identify and distinguish prerequisite programs for a HACCP management system. Discuss areas in which employees must receive education and training in order to understand their roles in producing safe foods. Identify the five preliminary tasks to be completed in the development of a HACCP plan before applying principles to a specific product or process. Discuss the seven principles of HACCP. Identify and describe the two stages involved in conducting a hazard analysis. Name and describe examples of possible CCPs. Identify and discuss the seven steps seafood companies must follow to help eliminate known hazards. Name five ways to test fish for freshness. Take course anywhere and anytime! We offer online HACCP Training in Kansas for: Wichita, Overland Park, Kansas City, Olathe, Topeka, Lawrence, Shawnee, Manhattan, Lenexa, Salina, Hutchinson, Leavenworth, Leawood, Dodge City, Garden City, Emporia, and many more!